:When Anna König first meets Bairn, the Scottish ship carpenter of the Charming Nancy, their encounter is anything but pleasant. Anna is on the ship only to ensure the safe arrival of her loved ones to the New World. Hardened by years of living at sea, Bairn resents toting these naïve farmers--dubbed "Peculiars" by deckhands--across the ocean. As delays, storms, illness, and diminishing provisions afflict crew and passengers alike, Bairn finds himself drawn to Anna's serene nature. For her part, Anna can't seem to stay below deck and far away from the aloof ship's carpenter, despite warnings. 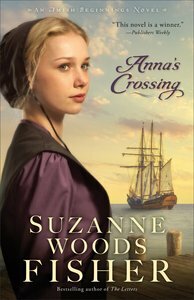 About "Anna's Crossing (#01 in Amish Beginnings Novel Series)"
Suzanne Woods Fisher is the best-selling author of The Choice, The Waiting, The Search, and A Lancaster County Christmas, as well as nonfiction books about the Amish, including Amish Peace. Her interest in the Anabaptist cultures can be directly traced to her grandfather, W. D. Benedict, who was raised in the Old Order German Baptist Brethren Church in Franklin County, Pennsylvania. Benedict eventually became publisher of Christianity Today magazine. Suzanne is the host of Amish Wisdom, a weekly radio program, and a columnist for Christian Post. She lives in California.Suzanne Woods Fisher is the bestselling author of The Choice, The Waiting, The Search, and A Lancaster County Christmas, as well as nonfiction books about the Amish, including Amish Peace. Her interest in the Anabaptist cultures can be directly traced to her grandfather, W. D. Benedict, who was raised in the Old Order German Baptist Brethren Church in Franklin County, Pennsylvania. Benedict eventually became publisher of Christianity Today magazine. Suzanne is the host of an internet radio show called Amish Wisdom, and her work has appeared in many magazines. She lives in California.